The Schedule for the day is available: thanks to all those that attended! 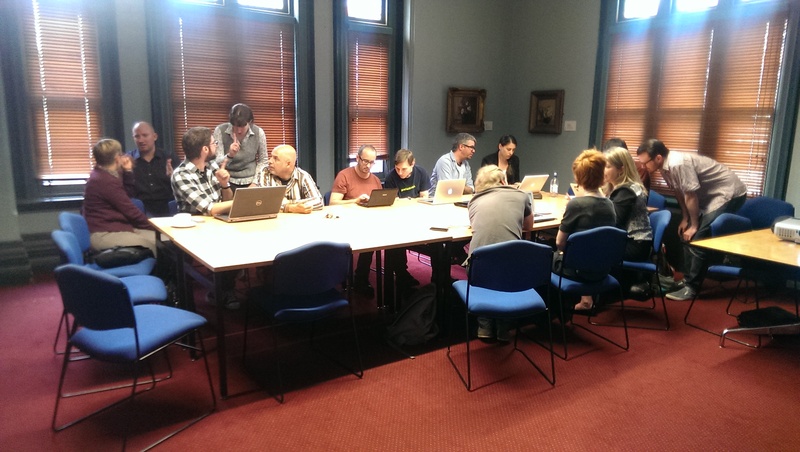 THATCamp Melbourne 2014 is all about participation, discussion, and fun through fostering a productive, collegial environment. The program for THATCamp is created and managed by participants on the day who vote on the sessions proposed. In preparation for the event we ask you to start thinking about some potential topics to workshop on the day. 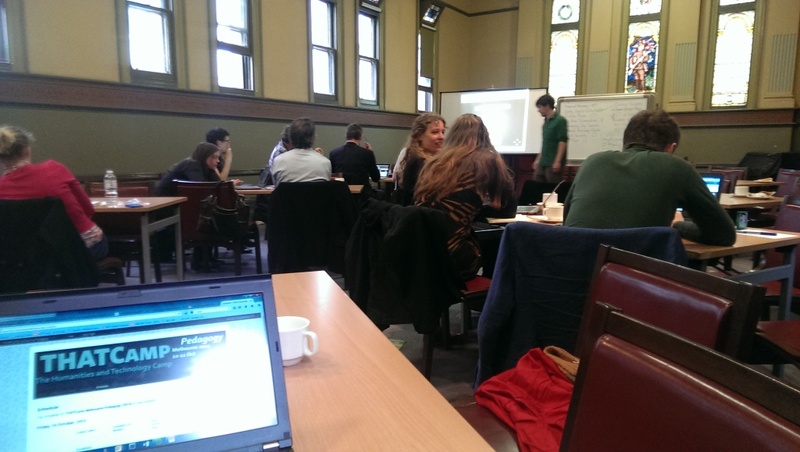 The core theme of THATCamp Melbourne (2014) is pedagogy. To get the ball rolling, here are some suggestions: ‘blended learning’ in humanities teaching, spaces for learning with technology, the creation, access and critical use of digital resources in teaching; serious gaming, grading and assessment through learning management systems, and social media in the humanities, for instance, effective moderation of social media tools for teaching. Great to meet everyone yesterday; my eyes were opened to problems and possible solutions I hadn’t previously considered! Following are some links relating to discussions I had with people on the day. I see Lachlan has beaten me to the punch on some of them, but I’ll reproduce them all here anyway. I think that’s all of them; if anybody remembers more let me know and I’ll amend the post. During all sessions yesterday there were links referred to that some people (me!) didn’t get down or that were promised. Someone was asking about Privacy and Scott Ludlum, and I told them about a Privacy workshop happening next week that he will be at along with a number of others in the field, including Angela Davy, Asher Wolf and Leanne O’Donnell. Also, for Fiona’s ipython/NLTK notes, there is an excellent intro to Python text written by a high school teacher for his students, called “How to think like a computer scientist“. It’s free to download, but you can buy the dead tree if you want. And for the ICT in schools/Education presentation, we were talking about MinecraftEDU for teachers and Kano for the young kids, and Matt’s curriculum is on github as part of CSIRO’s scientists in schools program. Do social reading and social highlighting have potential for teaching close reading and reading resilience in the tertiary environment? The relationship between reading and digital environments is complicated by numerous strong opinions on the impact of digital cultures on longform reading, attention, and the future of literature. But what opportunities do ebooks provide for taking a class through one or several readings of a text by demonstrating reading responses in the moment of reading rather than in a physical classroom environment. What opportunities for new engagements with reading are provided by online environments? The GLAM sector (galleries, libraries, archives and museums) are spending a lot of time digitising collections and making digital material available online. But while more and more people are accessing these collections, they are not necessarily creating interesting digital outputs from those collections. Students in universities are using online material more and more (some never, or rarely, setting foot in physical libraries and archives) but their ‘research outputs’ still tend toward essays and articles – the print paradigm – rather than creative, scholarly digital outputs. More broadly, communities search, post, tweet and pin digital collections; but how much do they mix, mash, re-use and remix? do you agree with the paragraph above? how can we better support teaching and learning activities so the outputs are truly digital, rather than just digital versions of prior (paper based) activity? are online collections presented and disseminated in a way which supports/encourages this sort of work? if not, what needs to be done to better support this work? what about more focus on digital interactions with physical collections, rather than ‘traditional’ interactions with digital collections? Overall, what can we do to move away from people doing basic stuff with digital collections, to people doing interesting digital stuff with all sorts of collections? Should we/can we resist Big Box Edumacation? Is anyone noticing the return to 1996 Learning Objects thinking, and the resurfacing or Learning Management (Systems)? Pearsons, itunesU, API, OUA, xMOOCs … they all seem to be taking us back to the 90s with ideas of prefabricated multimedia textbooks complete with facilitator guides and passwords to teach through. Add in learning analytics and we have what I think is challenging future in education. Let’s see if we can imagine another way. I’m an educational developer who’s been working in the tertiary sector of Australia and Zealand since 2001. I’m an outspoken radical (as easy as it is to be that in this conservative sector) looking for a smack-down or deliberation on an imagined problem. More practically, I’m wondering about the idea of resonance, and its relation to organisational change and direction… anyone in? Mine’s a bit of a helpathon: wondering if anyone’s interested to share their techniques and tools for managing digitised archival sources? I have a research project of about 750 images from approx 30 different series that I’m slowly adding to. I’d like to find a tool that displays them and their metadata and allows notes and tagging. A tool I’ve tried is Omeka but couldn’t find a bulk upload functionality for images and metadata. If anyone has some suggestions I’d love to hear from them! 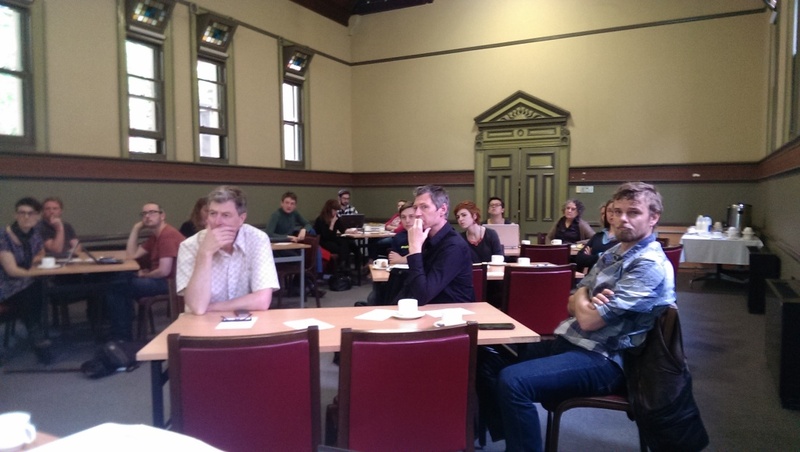 This discussion is based upon research being undertaken in Computing and Information Systems and the History and Philosophy of Science at the University of Melbourne. The growing use of software applications in the home, the workplace, and in public places has resulted in the increased production and use of personal digital files. These digital files may take the form of emails sent to colleagues, photos of family and friends taken on a camera or smartphone, music downloaded from a number of different services, or videos taken at weddings or birthday parties. In this environment of increased data production and usage, unavoidable questions arise as to what happens to these files when a person dies. We will address this question in regards to a broad spectrum of digital media types and services with a particular emphasis on describing the current ownership and privacy issues (key to understanding how digital files may be storied or bequeathed to another person). There is, in general, a lack of understanding about the rights individuals have over the digital files they buy or produce that has implications in the context of death. 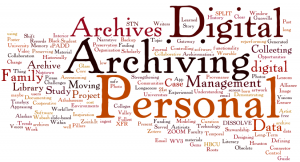 An emerging approach to managing digital legacies are ‘personal digital archives’. Personal digital archives and personal data – the data relating to an individual’s life – has until recently been neglected in the debates and practices about archiving (so, for example, it is only in recent times that online companies have provided facilities to download personal data for local storage and safekeeping). We will discuss some of the emerging trends and problems with digital legacies and personal digital archives in the group. I could do either a quick overview of general tools to keep oneself digitally secure in Australia – encryption, Tor, PGP, VPNs, Cyanogenmod, Linux (and Windows/OSX if that’s what people want) – an over view of each. Matt Cengia would probably make a good heckler for when I make a mistake or forget something important. Although field-trip refers to a field, it is possibly not the best place to go on a trip. But they are fun unless the teacher takes the idea of a field too literally. They are great way to learn many things in science, geography, history, and many other subjects that are boring because they aren’t science, geography or history. – If you have duty of care over children, you can focus on ensuring their safety. We will also discuss assessment. Regrettably that is a necessary part of teaching. I provided technical support for two augmented reality field trips when I worked at the university of western sydney last year. The first had 100 first year students who were accompanied by staff. The second had 1000 first year students who were self-directed. They visited interesting landmarks to learn about urban processes and social differences. – If you are very keen, sign up for aurasma studio. This is what you will use if you are dealing with a large amount of content but it takes a day or two to be approved. I would also like discuss communities of practice and what “we in the room” can do to help teachers make the resources for field trips, share them with other teachers, and add to it to improve the work of others. Although I am currently a user of one app, I do not endorse any single AR company. I believe the audiovisual materials and lesson plan resources should be collected, maintained and shared in an independent repository. Preferably one outside any particular education system or corporate interest. The more technology oriented in the room may be interested in the idea of allowing programmable access to materials. This will allow civic hackers to mash-up other data with your content and add value to your teaching materials. 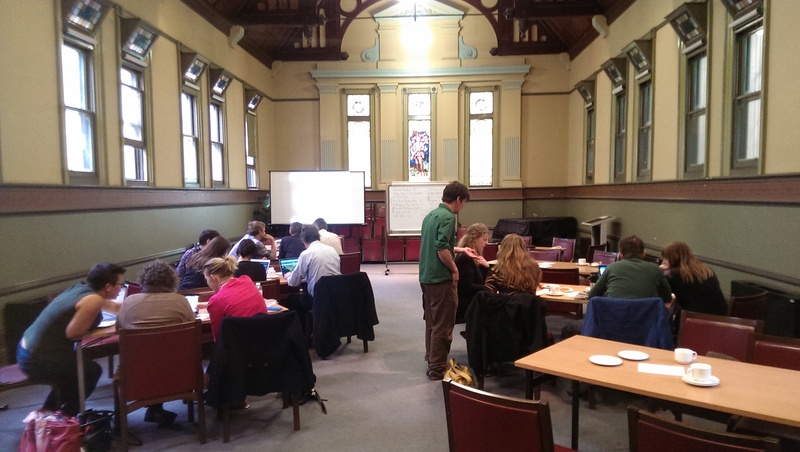 At the University of Melbourne’s Research Bazaar, we’re exploring digital tools for Humanities and Social Science scholars and are developing a course in the Natural Language Toolkit (NLTK) to help researchers and teachers perform quantitative analysis of large bodies of text. If you’re interested in learning about how Natural Language Tool Kit can be applied to text to analyse features of language, we’d love you to join us in this workshop. The materials are new, so we’re looking for your help to develop the course. There will be a brief introduction to some of the key features of Natural Language Tool Kit, and, time permitting, we’ll begin to explore some of the Malcolm Fraser archive, held by the University of Melbourne. 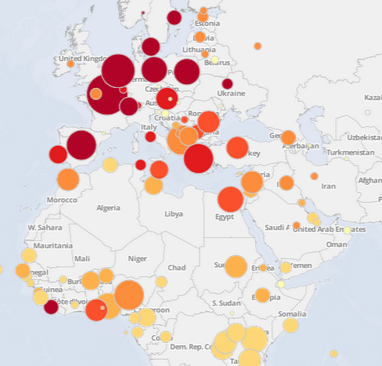 Does your data need a map? It’s a well-honed workshop we’ve been running over the last 18 months or so, aimed particularly at researchers in the humanities and social sciences. By the end of the workshop you’ll know how to import different kinds of data, geocode data where necessary, create 6 kinds of visualisations, and have a taste of how to take your visualisation to the next level with custom CSS and SQL. It’s all very hands-on, driven by a series of short challenges like “make your visualisation look like this”. The slides are all available online, so you can skip ahead or go back, to match your own learning pace. Steve Bennett has extensive experience providing tools and training to researchers in both government and academia. Prior to joining the University of Melbourne’s ITS Research Services team, he led data management projects at VeRSI (now V3 Alliance), working with researchers from a wide range of disciplines. An open data enthusiast, Steve has contributed extensively to projects such as Open Street Map and Wikipedia and he is the driving force behind Melbourne’s DataHack meetup group. He has run mapping workshops for The University of Melbourne and Deakin University and his mapping projects have featured on the ABC and The Age. Steve believes that everyone needs maps. With the advent of MOOCS, Open University Australia and the growing trend for online, external enrolments, the traditional workbased assessment is becoming harder and harder to enable. I’m currently teaching students about preservation and conservation of information materials, both analogue and hardcopy, and archival description. I’ve also taught a unit in heritage assessment. 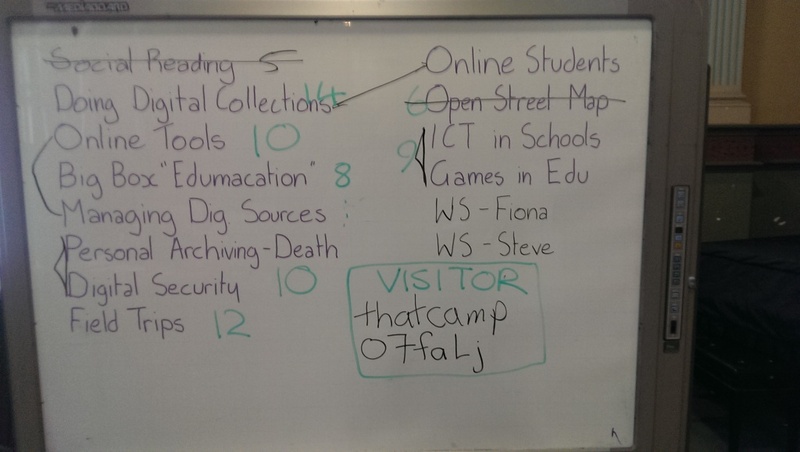 Each of these has a practical component, which requires the students to engage with the theory and the practice of the discipline they are studying, but also to come face to face with the objects they are studying and analysing (both in digital and analogue format). Short of digitising collections or buildings and putting them all in Secondlife, there seems to be a risk of lack of engagement with the materials that are the subject of description or study. In digitising the material or site, I will inevitably describe them, simply to make them findable, which in some ways provides the student with the first clues (and sometimes second and third clues) to the way they approach a project. How do I capture the viscerality of the heritage site or original object; the surprise and consternation when a student is first taken to a site, opens a box, tries to save a digital object? Who supervises the work, and how can that be done? 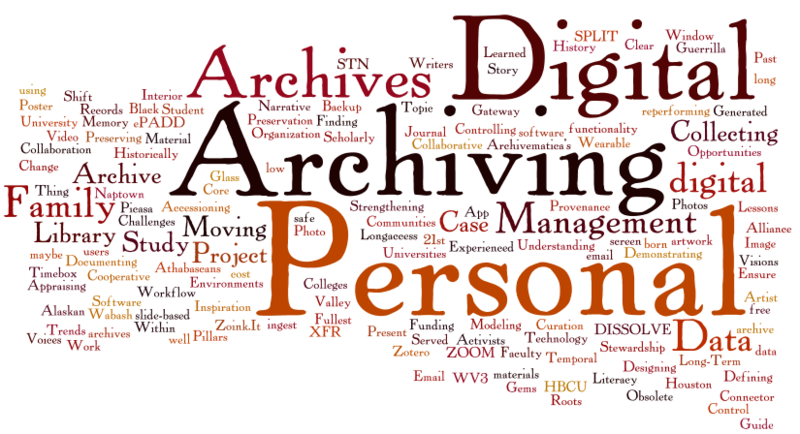 In a recent blog, T.J. Owens has proposed a way of documenting the individual pieces of an archive file using a shared library like Zotero – http://www.trevorowens.org/2014/09/linked-open-crowdsourced-description-a-sketch/#comments. As you will see from the comments, I have some concerns about how that will work in practice in an archival institution, but are there elements of his idea which can be taken for use in the sort of project I’ve just described? Push or pull? Where will the description be hosted, how will it be accessed, how long will it last and who will sustain it? Does it need sustaining? Are we simply talking institutionalised crowdsourcing? All text and code on THATCamp Melbourne Pedagogy is freely available for you to use, copy, adapt and distribute under a Creative Commons Attribution 3.0 Unported License as long as you link to THATCamp.org and the Center for History and New Media. The name "THATCamp" and the THATCamp logo are trademarks of the Center for History and New Media at George Mason University.